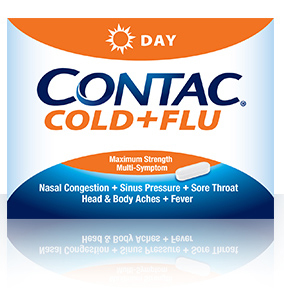 When a head-cold has got you in a fog, reach for immediate-release, non-drowsy relief with Contac® Cold + Flu Day so you can power through your day. A single dose delivers the maximum strength without a doctor’s prescription, so you can get relief from a multitude of symptoms with one, simple solution. Inactive ingredients: Hypromellose, microcrystalline cellulose, polyethylene glycol, potassium sorbate, povidone, pregelatinized starch, sodium lauryl sulfate, starch, stearic acid, talc.